As recently as five years ago, securing a network meant putting in a firewall, intrusion detection system, and installing antivirus software on the desktop. Unfortunately, attackers have grown more nimble and effective, meaning that traditional security programs are no longer effective. Today's effective cyber security programs take these best practices and overlay them with intelligence. Adding cyber threat intelligence can help security teams uncover events not detected by traditional security platforms and correlate seemingly disparate events across the network. Properly-implemented intelligence also makes the life of the security practitioner easier by helping him more effectively prioritize and respond to security incidents. The problem with current efforts is that many security practitioners don't know how to properly implement an intelligence-led program, or are afraid that it is out of their budget. 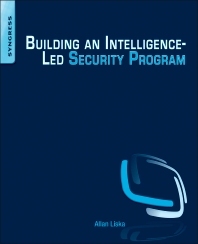 Building an Intelligence-Led Security Program is the first book to show how to implement an intelligence-led program in your enterprise on any budget. It will show you how to implement a security information a security information and event management system, collect and analyze logs, and how to practice real cyber threat intelligence. You'll learn how to understand your network in-depth so that you can protect it in the best possible way. Provides a roadmap and direction on how to build an intelligence-led information security program to protect your company. Learn how to understand your network through logs and client monitoring, so you can effectively evaluate threat intelligence. Learn how to use popular tools such as BIND, SNORT, squid, STIX, TAXII, CyBox, and splunk to conduct network intelligence. IT security professionals like security auditors, security engineers, compliance specialists, etc. ; IT professionals like network administrators, IT managers, security managers, security analysts, directors of security, etc. Chapter 2: What is intelligence? Allan Liska has more than 15 years of experience in the world of information security. Mr. Liska has worked both as a security practitioner and an ethical hacker, so he is familiar with both sides of the security aisle and, through his work at Symantec and iSIGHT Partners, has helped countless organizations improve their security posture using more effective intelligence. In addition to security experience, Mr. Liska also authored the book The Practice of Network Security and contributed the security-focused chapters to The Apache Administrators Handbook. Allan Liska, security practitioner, Symantec and iSIGHT.